How do you like this ad? That’s very creative. We’re surrounded by so much that’s bland and boring in the way of advertising (the field in which I make my living, by the way), I really enjoy seeing creative applications like this. One of the reasons you don’t see more things along these lines is that mass production of the same techniques over and over again doesn’t always work. But there are a few folks who are really looking to make an impression, rather than to just flood the market with brand info. 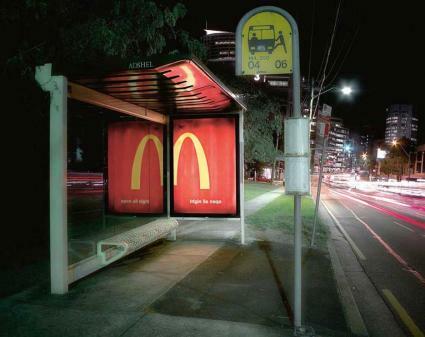 That’s when advertising truly gets fun. It is ads like this that get a lot of attention. Thanks for posting the image. I love it. Glad you love it and thanks for posting! [Robot voice]: It … is …. amusing. [Normal voice]: I still won’t eat their fries, ‘though. They should cook proper chips. Hehehe, that’s true TigerTom. Although, I think they have a new fries partner. At least in Germany and it is quite better now!